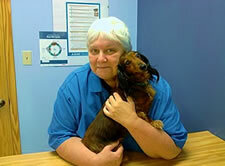 Dr. Tanya Hamilton graduated from the University Of Tennessee College Of Veterinary Medicine in 1981. She worked for several years after graduation in Nashville and North Carolina. After spending a few weeks in Haiti with Christian Veterinary Mission, she opened North Knox Veterinary Clinic in January of 1987. Dr. Hamilton has 3 children, adopted from Honduras and Guatemala - Seth, Joy, and Eli. She also has three grandsons, three very special boys, Gabriel, Adrian, and Ezekiel.